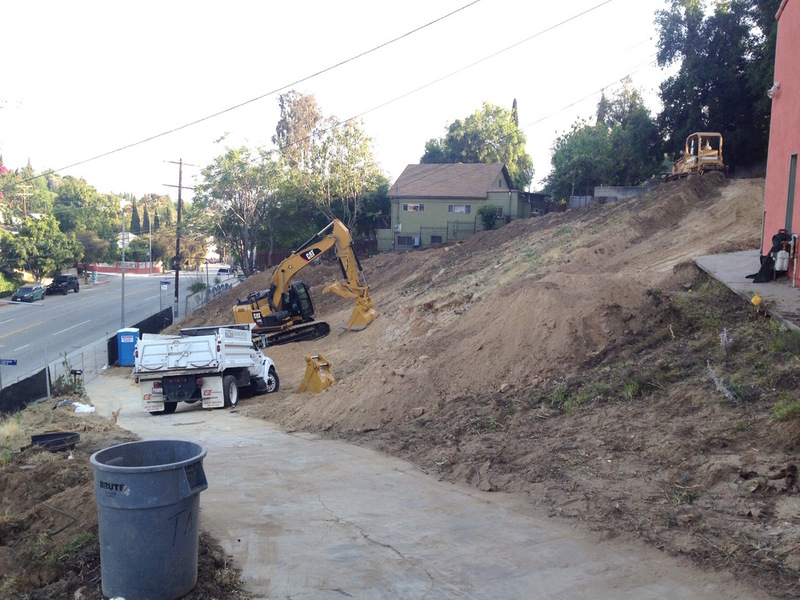 We've just completed the bulk of the complex site work, grading, and shoring at our Silverlake Nine Small Lot Subdivision project in Los Angeles. As expected, the earthwork has been quite a tedious process. But we're on schedule and budget. Next, we'll be moving quickly into laying foundations and going vertical with framing, starting with the upper three units. Just hoping El Niño holds tight for a little..
Expect to see some serious action in the upcoming months! We're very excited to officially break ground on SILVERLAKE NINE, our 9-house Small Lot Subdivision with Barth Partners. This complex, hillside development on the backside of Silverlake Reservoir is one of the largest in the area and has been in the political spotlight since day one. So it's been quite an effort getting it through design, engineering, entitlements, and permitting. But we've succeeded, and are now full bore into construction with TNT Simmonds at the helm. To top everything off, a new Whole Foods just began construction within walking distance! Sales to be released around Summer 2016. More updates to come!